In blender combine 1/3 cup each of sunflower seeds, pecan pieces, and cashews. (You can mess around with substituting these; I actually did about 50% pecan, 35% cashew, 15% pine nut in today's batch.) Add 3/8c oil (ideally something like 50% canola / 50% some nut oil like walnut, almond, or hazelnut). Blend until well ground. Add 2/3 cup milk and blend in. Set aside. Add yolks to blender, and blend until smooth. Place 4 cups of Bisquick (regular, or low fat if preferred; or substitute previously described) into separate large mixer bowl. Dump in contents of blender. Rinse blender vessel with 2 cups of milk, adding that milk to bowl of soon-to-be-batter. Mix using paddle on a low-ish setting (start at the basic "stir" setting, and go no higher than about 4) until it generally comes together, forming a slightly lumpy batter (should only take about a minute). 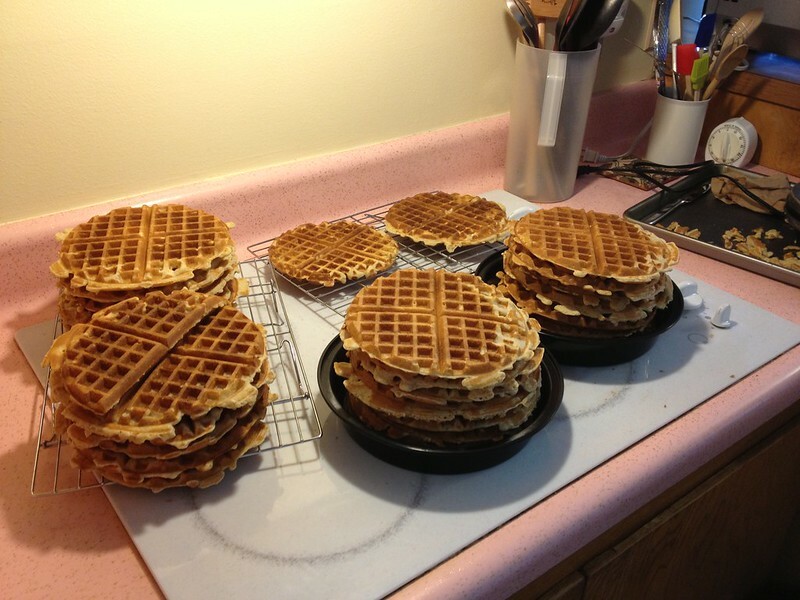 Turn on waffle iron, so it will be fully heated as soon as the batter is ready. Pull bowl out of mixer, add egg whites into batter gently with a rubber spatula -- don't stir, just fold the meringue down into the batter. Leaving clumps of meringue is fine, because next you shove back under mixer, re-attach paddle, and stir for another 15-30 seconds to fully combine. And here are instructions from my brother Greg on his variant, which has kind of a crunchy / granola-y texture, and is much faster to mix up. In a Cuisinart type food processor, throw together about one cup of whole oats, one cup of flax-flakes or similar stuff, two cups of walnuts, 1 cup of almonds, 1/2 cup of corn meal. Then I just turn the sucker on until it's evenly mixed and chopped into little tiny pieces -- not chunks, not plasma, just nice and grainy. Then I put the whole shebang in a jar and use it to mix up various things, including the waffles. Take about 1 cup of the mixture from above, 1 cup of Bisquick (if you can find a no-hydrogenated-fats mix that works nearly as well, let me know; every "crunchy" substitute I've tried produces yechy waffles), 2 Tbsp. brown sugar. Mix dry ingredients until, you know -- mixed. Put in 1 egg, 3/4 cup of plain, whole yogurt, and then enough milk to make it the right consistency for waffle batter. If you're into a bit of oil, splash a bit of canola in there before whisking together. Let it "breathe" for a minute or two to make sure your consistency is what you want, then waffle away. That's what I do anyway. Nothing to say that it's as good as it could be. Of course, I recommend all natural, organic, outrageously tree-hugging ingredients of every kind whenever you can get them. If you come up with improvements / fun variations, let me in on it.